Benefits that support employees’ work/life balance are among the three types most closely linked to higher retention rates, according to Mercer research. Mercer’s 2014 Australian Benefits Review involved more than 350 employers with effective or very effective benefits programs, and correlated results with their turnover, salary increases and perceived morale. The first theme to emerge from the study is that organisations with higher retention and revenue growth apply their benefits more equally across the workforce than others. These organisations have “less differentiation of benefits for seniority and less restrictions between levels,” according to Mercer associate Dylan Ward. He says that breaking down hierarchies in benefits schemes “encourages empowerment and responsibility more broadly across the organisation”. insurance – access to death/TPD, salary continuance and private health insurance is provided not just to full-time employees but also part-timers, casuals, visa holders and employees over 65. The organisations with very effective benefits and higher retention are also more likely to support employees’ work/life balance, the research revealed, and they do this in two key ways. First, employees have more flexibility and choice around their benefits. This might mean being able to choose between a car allowance and a physical car, for example, or the ability to purchase extra leave, access time off in lieu, or select their own retirement investment options. Secondly, the benefits are more likely to support employees’ personal wellbeing and lifestyle. Employers are, for example, more likely to provide access to additional parental leave, offer more company-paid social events and health and wellness benefits (such as flu shots and health checks), and subsidise health and travel insurance. Commenting on the research, leader of Mercer’s talent business, Garry Adams, told HR Daily that quite often organisations structure their benefits according to what others in the market are doing, but “but for real business impact, employers need to establish meaningful links between innovative benefits and the desired behaviour of their workers”. The organisations with very effective benefits do this in a number of creative ways, Ward adds. Organisations wishing to reduce liabilities on their balance sheet, for example, might reward employees with extra leave if they use their annual entitlement. Other initiatives include aggressive sales commission plans for organisations keen to link pay to performance, or share purchase plans where employees can buy into the success of the organisation. 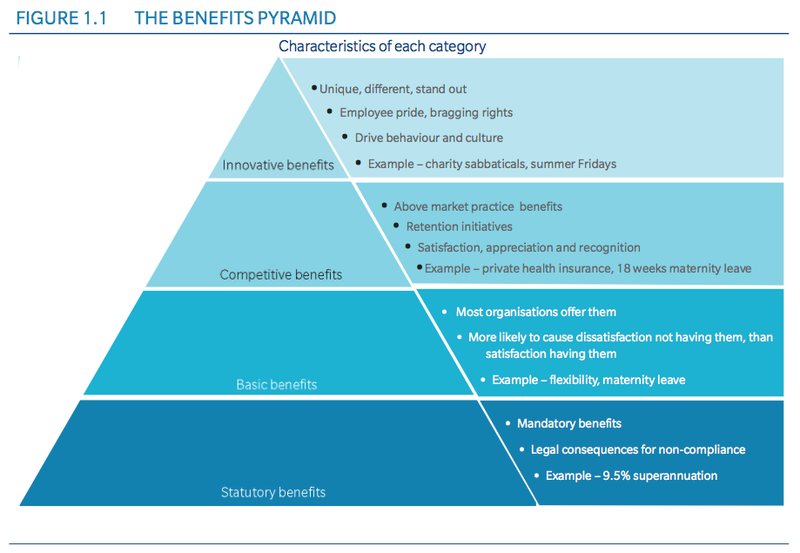 Mercer categorises employee benefits in four ways (see image above), and focuses its research on competitive and basic benefits, Ward explains. Basic benefits are “generally expected” in organisations, and are more likely to cause dissatisfaction due to their absence, than satisfaction from having them, Ward says. Competitive benefits, on the other hand, usually go above and beyond those offered by most organisations, and are a big area of opportunity for employers because they drive employee satisfaction and retention. The research found that at organisations with very effective benefits, turnover averaged 12 per cent (compared to 15% in the broader market). At these organisations employees also generally worked more hours (43% of senior managers work more than 50 hours a week, compared to 25% across the market as a whole), which Adams says indicates that “when employers give more they get more”.